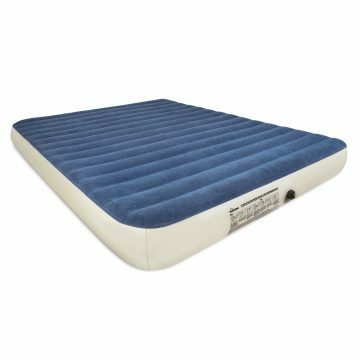 What to Look for in a Camping Mattress? What is the Best Brand of Air Mattress to Buy? Comfort is the name of the game, and if you want to be a top contender, you need to find what works for you. SoundAsleep is designed to provide a more eco-friendly, natural-feeling way to enjoy your time in the great outdoors, including a primary PVC design to keep things on the cheaper side. PVC is known to be one of the most durable materials for use in just about any situation, and when you’re dealing with the unknown outdoors, this can be some nice peace of mind. As the best queen air mattress for camping, it supplies superior comfort with a great thickness of 9” (the standard thickness of most medium-tier queen mattresses for your home). ComfortCoil technology and I-Beam air coils work simultaneously to contour to pressure, and your body’s shape to provide support while you’re asleep. 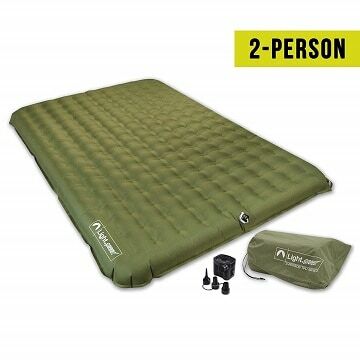 With all of those components tucked away inside the mattress, you’re granted a total of 500 lbs on the weight limit, making this a great air mattress for couples camping out under the stars together. There’s also an inclusive electric pump to get camp set up far earlier than the old way of manually blowing air into the plastic tube. The electric charger comes with a great battery life, but it’s also rechargeable so you won’t have to toss out batteries all the time. Between that and the lightweight mattress itself, you can carry everything in the included travel bag. Stash it in your backpack, and you’re good to go. If it’s because your back is always killing you in the middle of the night, we’ve found your replacement. The best camping mattress for bad back problems is here to offer immense comfort, but more than that, it brings support to help alleviate middle-of-the-night pain and discomfort. When your sleep gets broken up, you don’t enjoy your camping trip nearly as much, and you’ll also be less alert. Save the hassle. Intex keeps you 22” off the ground, which is insane when you compare it to just about any mattress. It’s taller than most queen bed and box spring combinations, except it’s all support. It isn’t just there for your back troubles though, it’s also there for peace of mind. Intex made this completely waterproof from top to bottom, and thanks to that durable finish, it also raises the maximum weight limit to 600 lbs. You’ve already got back issues, so Intex didn’t want to make you bend over and manually blow air into the tube. You get a rechargeable electric pump, one that fills this mattress up in under five minutes. As a word of the wise, make sure your dial settings are turned completely, otherwise your pump will waste its charge without doing anything. Fiber-Tech construction keeps you aloft, so you can keep your dream clouds floating overhead instead of waking up in back pain. One of our runner-up models comes with an unbeatable price, and is arguably one of the best inflatable mattresses for camping. Period. There’s a lot of hate for PVC in the camping community, because it’s ridged, so Lightspeed wanted to accommodate to those of you with reservations regarding materials. TPU is a durable and flexible material, and in this air mattress, it guarantees zero air leaks throughout the lifetime of your product. You can comfortably sleep two, but keep in mind that it’s only 7” thick and has a maximum weight capacity of about 450 lbs. 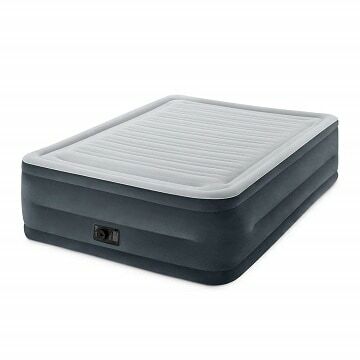 However you sleep on this, your weight won’t negatively impact comfort; there’s a system in place to evenly distribute comfort no matter where you lay, so you don’t sink into one side of the mattress while the other puffs up (we’ve all had bad aero beds before and remember this happening). One of the defining attributes of Lightspeed is the ultralight carry weight. You’ll be able to stash this in just about any bag, regardless of your total liter capacity. It folds up to a compact size, and weighs a total of 6 lbs, making it one of the most lightweight, quality air mattresses for camping that we’ve ever used. You’ll also get an electric pump with three different attachment heads, and a carrying case to keep everything in. If you’re a minimalist camper, you’ll find massive value in Therm-a-Rest’s revolutionary air bed solution. 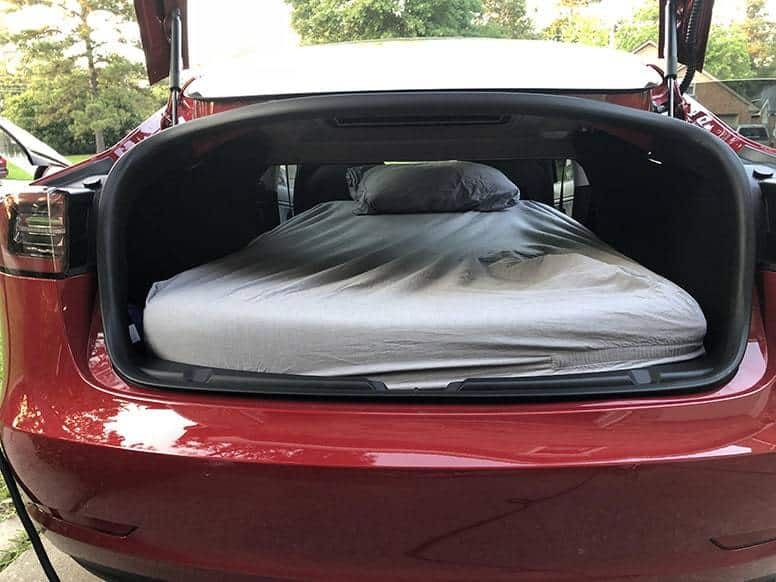 This also doubles as the best travel mattress for road trips and visiting the inlaws, because it’s super lightweight at 5.5 lbs, and compresses extremely well. The defining characteristic with this is the complete lack of a setup time; it’s done in seconds, because it’s compressed self-inflating foam. There’s no better way to get the campsite set up right off the bat. Now it does have a slightly thin build at 4”, which isn’t an issue for most campers, but depending on the terrain or if you don’t use a sleeping pad underneath it, you might feel a little something through the mattress. Foam contours to the environment more, so as long as you pick a good spot, comfort issues will be minimal. You’ll also get a compact carrying case for backpack storage. Last but not least, there’s a firmness setting you can utilize. You don’t need to do anything to set this up, but if you want to make the mattress more firm, you can give a few breaths into the valve to tighten everything up. This is designed for single-person use, but if you get a second, the sidewalls can attach together without much of a seam in the middle. Etekcity has had their fair share of average products, particularly when you get into electronics, but they’ve done a bangup job at this. As the best inflatable camping mattress for budget buyers, you get an electric pump with your purchase that handles all the hassle for you. It takes an average of five minutes to get this 9” airbed pumped up, and as a heads up, the pump’s power supply won’t be able to handle two full inflations on a single charge. Make sure it’s hooked up properly from the start to avoid doing it the old manual way. Etekcity calls their comfort technology wave beam inner support walls, and while it’s a comfortable enough air mattress, their marketing makes this seem like a more high-end product than it is. The only other dodgy marketing tactic they used was disclosing their warranty, which is only for one year, unless you register your product with your order number. Is it a big deal? No, but other brands don’t do this; they’re banking on forgetfulness. Thankfully, this is built extremely tough, and we don’t think you’ll need to call on it in the first place. The mattress itself is designed for single use, but a couple could squeeze in on this. You have a 450 lb maximum weight capacity, which is a testament to the quality build. They really took durability as their primary priority, making this completely waterproof and puncture-proof as well. They made this out of natural fibers, which actually pass the prop 65 approval necessities, and is available for sale to residents of California. Support and comfort are two different things. There are plenty of air mattresses that offer short-term comfort, but leave you feeling stiff and achy the next morning. Good support will lead to good comfort, so long as it matches up with your height and weight. You’ll find that materials like TPU and PVC give a great level of support: they’re ridged, durable, yet soft enough that you won’t regret your decision. 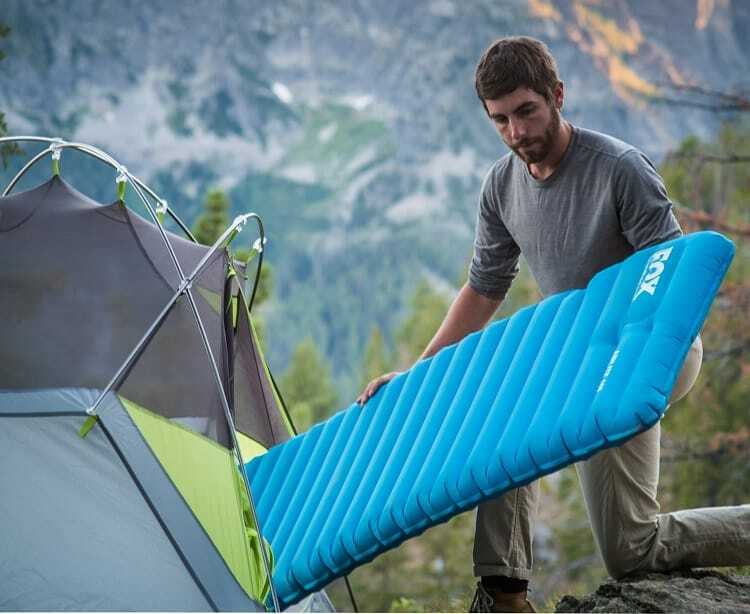 The main thing to think about with support is that you need to cradle your neck and spine, and no air mattress will do that for you; you need to bring along a great camping pillow as well, which none of these brands ioffer with your purchase. Most air mattresses come in three size variants: twin, queen, and within a few inches of a queen mattress in sort of a gray area. These usually measure about 77” x 30”, and the thickness is dependent upon the brand and what they’re using. For most adults, this will work as a single sleeper, but you’ll want 36” of width or more for a double sleeper. Size also shouldn’t impact your comfort, at least with these air mattresses, which feature weight distribution properties to prevent “dip spots” that feel like they’re sucking you in. There’s a ton of ways you can measure this, but one of the more reliable ways is to look at what top-level technology the compact is using. They’ll try to toss around a lot of high-end buzzwords to make it seem better than it is, which is why it’s a good time to scan reputable, legible reviews to see what customer experiences have to say about it. Air cells and additional padding up top are usually good enough to sustain a great level of comfort for your trip. We know the dimensions are important, but deployed size isn’t the only thing you should be looking at. If you’re a minimalist camper that’s taking one backpack along, storage space is also big. Keep in mind that with some of these, you’ll also be bringing the electric pump along with you, so account for that in your backpack space. Portability is a major thing to account for, so be sure to pay attention to the deflated total weight of these mattresses; some of them might surprise you. This is where you get into the argument over materials. PVC is durable, but not always eco-friendly (it takes a special brand to make it environmentally conscious), and TPU is far more elastic and resistant to punctures. The durability heavily depends on the brand; you’re not going to find a no-name, cheap air mattress that can handle the mishaps that happen out on the campsite. Whether it’s sleeping with your keys in your pocket, or keeping your boots on and accidentally dragging them across the sidewall, you need a durable air mattress to help you account for the unknown out in the wilderness. We all have nightmares of manually inflating aero beds back in the day, but regardless of what you go with on this list, you won’t have to do that. You’ll either be able to pick a self-inflating foam mattress that gives you a quick setup, or any other mattress that comes with an electric air pump to take care of everything for you, usually in five minutes or less. Electric pumps are a standard accessory that come with most air mattress purchases nowadays. We’re pitting SoundAsleep and Intex against one another here, because it really was a difficult decision on which one to crown the king of this list. Let’s look at a few differences between the two, and help you whittle down your list of pros and cons. In terms of thickness, nothing can compare to Intex and their 22” air mattress. It still features a short inflation time, and don’t have that feeling of sinking into it like you get with standard aero beds. The only issue is that, when and if you get a puncture, you’ll be swimming in your own sweat if you wake up in a deflating bed. SoundAsleep has a thinner mattress, but rely on their materials to supply comfort over air space. That’s not to discredit Intex in the least; they made their mattress fully waterproof, and the elevation helps you avoid impromptu rain showers that happen from time to time when you’re out on the trail. SoundAsleep is lower to the ground, but the PVC material is also naturally waterproof, so you’ll still be protected, you would just be closer to any treading water in your tent. In terms of overall value, it’s a close race. They definitely have their differing attributes, but both pose the benefits of comfortable rest, fast setup, and sit at around the same price. 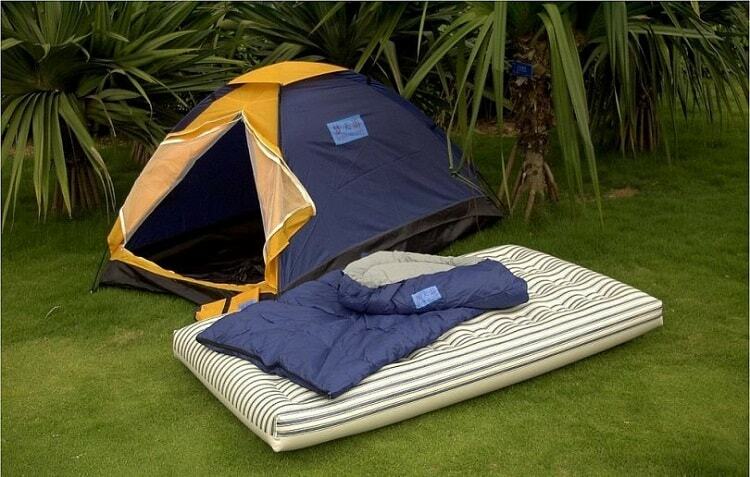 You would be well-equipped with either one of these by your side on your next camping trip. How Does an Air Mattress Work? Air fills the crevices inside the main material, creating pressure and providing a level of support for your back. Air mattresses don’t support your spine or neck, which is why we recommend bringing along a camping pillow with you. Some air mattresses have air cells, which are miniature pillow-like components underneath the top layer. These fill with air to provide comfort, but also stability, and a way to evenly distribute your weight across the entire mattress, regardless of where you’re laying on it. You simply inflate, get it to a reasonable firmness, and set up your blankets or sleeping bag on top of it, and you’re done. Camping air mattresses usually use an electric pump, or come made out of self-inflating foam to take the hassle out of setting things up. Just about all modern day camping air mattresses (the ones that are worth your consideration) come with an electric pump, so there’s no more leaning over and manually blowing air into your mattress anymore. Air mattresses run into issues during camping for one reason, and this is something that’s just scientific and can’t really be fixed by one brand or model: air temperature deflation. It gets colder at night, and when this happens, the air thins out in your mattress and begins to deflate. It’s something that we will continue to run into. How Comfortable Are Inflatable Camping Mattresses? It depends on what feature and brand you go with. Many buyers have these memories of low-grade air beds that they used when staying over a friend’s house, but that’s simply not how they’re made anymore. You have air coil technology, which essentially fills small pockets in the height of the air mattress to provide additional support. In some cases, if you have a bad back, it can be more comfortable than a standard spring-and-coil mattress. 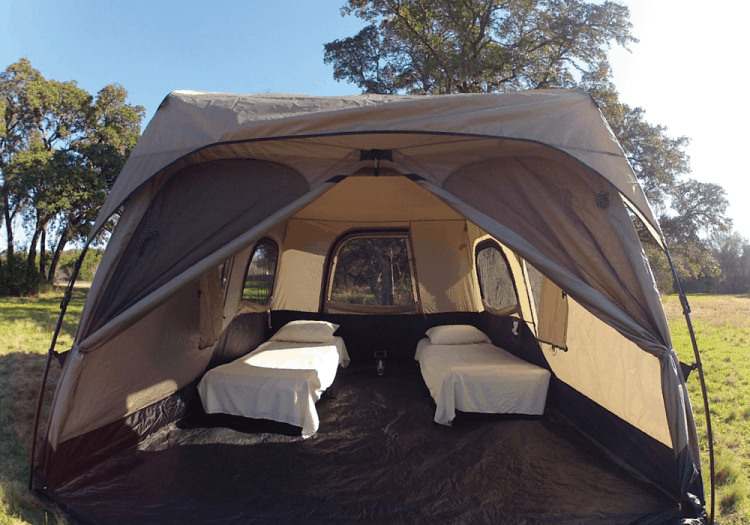 Air beds make the best camping mattress for couples as well, offering a mix of support and plush comfort in just about every model that we’ve listed her. Pay attention to what material the top of the mattress is made out of as well. If you experience 10-20% deflation through the night, (say if you have a leak), then you won’t wake up in a puddle of sweat from a plush top. Air coils help, but the ideal reason that you’re getting an air mattress for camping isn’t solely for comfort, but for support. You should bring along durable, warm camping blankets, pillows and clothing to increase your comfort level. You’re looking for support against the cold, hard ground, and that’s the primary objective of these camping air mattress companies. What Is an R-Value When It Comes to Camping Mattresses? Quite simply put, an R-value determine the warmth level of your camping mattress. The higher your R-value, the more heat retention your air mattress will get. We don’t personally look at this as a huge factor, because nobody is laying on their air mattress (at least in the outdoors) without additional means of staying warm, whether that’s a sleeping bag or blankets. If you’re sleeping on extremely cold weather, you’re already lined up to run into issues with an air mattress and losing inflation due to expansion. R-values aren’t a ride or die attribute of a good camping mattress. The only major benefit to having a good R-value is lessening the deflation that happens during cold temperatures. When the digits dip down low at night, you can endure a bit of deflation from your air mattress. A good R-value helps you retain heat, lessening how much it will deflate. Make no mistake, an R-value isn’t going to solve deflation issues, they’re just something that happen with just about all air mattresses, at least to some extent. What is the Perfect Camping Mattress Size? This is one that’s left up to partial interpretation. When we looked at the best air mattress for camping reviews online, we even found that those who spoke highly of the product would complain about the size. The key thing to remember is: everybody is built differently. What works for me may not work for you, and vice versa. That’s why we recommend going with a true queen sized mattress, being 80” long and 30” wide, for a single sleeper. This lets you utilize any weight distribution properties in your air mattress, without feeling like you’re not getting a good night’s sleep. Even tall gents at 6’6” will have plenty of foot space, while also ensuring their head doesn’t start to slide down off the top. If you’re going to use an air mattress as a sleeping pad, and still plan on being in your sleeping bag on top of it, measure the dimensions against one another so you can determine how much extra space you’ll have on each side. Nobody wants to wake up face-first in the dirt after rolling off their air mattress. Can You Use an Air Mattress on a Camping Cot? The best camping beds are built tough, but depending on the cot you have, you shouldn’t put them up on top. The average width of a cot is around 28”, whereas you’ll see 29” to 32” average width on air mattresses. 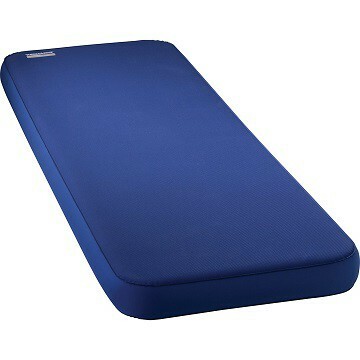 These airbeds are usually designed to handle weight distribution from moving around in your sleep fairly easily, but when you add the side rods of a camping cot and the uneven amounts of pressure on a foreign object, it doesn’t look good. Even if you go with a puncture-proof, at the very least, puncture resistant air mattress, you still don’t want to push the limits. If you can find an airbed that’s thin enough to fit on a cot, you’re welcome to try it, but we don’t recommend it. If you’re worried about elevation or comfort, go with a model like the Intex (our second pick), to be 22” off the ground and feel maximum comfort. How Long Do Air Mattresses Last For? Usage equals deterioration, but the rate at which a product loses its luster depends on the brand who made it, and the materials they used. As a general rule, an air mattress is good for about five years before you run into issues with potential micro incisions and damage that’s invisible to the naked eye. You’ll see many of the brands we’ve listed here today that include a one- or two-year limited warranty on their air mattresses. That’s there if you need it, but nobody wants to actually call in their warranty and pack up their product, pay shipping, then wait for a new one to come in the mail: we want to get it right on the first try. With proper care, your air mattress can last those full five years. If your air mattress is puncture resistant, don’t push the limits. If it’s waterproof, don’t put it in situations that test that waterproofing. Just because it can do something, doesn’t mean it should be put into that situation repeatedly. That’s when you see degradation from use, even when it’s a durable product that’s designed to last. Only inflate to 90-95% of the maximum amount allowed. 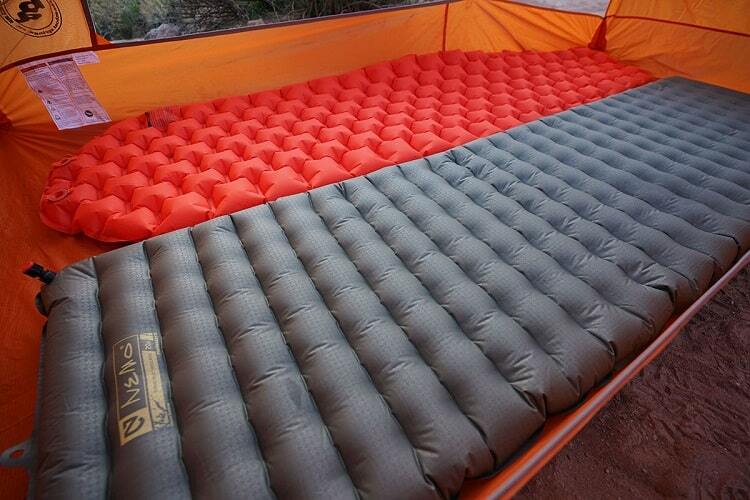 Use a sleeping pad beneath it to prevent unexpected damage from rocks and rough terrain. Use it during summer camping trips, avoid winter trips or cold weather. Deflate immediately after use and store right away. These and other common sense tactics will maintain your air mattress for at least five years, save for any freak mishaps, and give you the best experience with your air mattress. It’s also wise to buy an emergency patch kit and keep it handy. You’ve got the most comfortable camping bed; now it’s time to put it to good use. We can’t tell you where your camping trail is going to take you, but we know that with one of the camping mattresses we’ve reviewed today, that you’ll be comfortable when you get there. Pop open the air mattress, take a load off, and enjoy. We cover other topics on camping and hiking-related products and information, so be sure to check them out to equip yourself for whatever tomorrow brings.